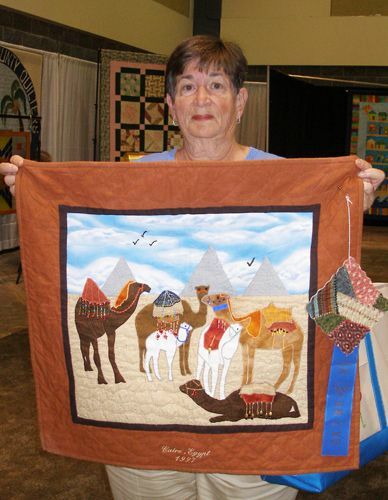 This pattern contains six Domedary Camels with back packs and saddles to stitch with satin stitching and raw edge applique. You can embellish them with seed beads and other kinds of small beads. You can add a pyramid in the background if you like, since these camels come from Egypt. The clouds are made with badding and a twisted tulle overlay, and embellished with white seed beads. Each drawing is a complete camel so you can arrange them any way you like. 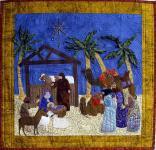 This quilt was made by Kay Schubert, of Cincinnati, OH. It won 1st prize in the Clinton County OH Fair.